Hello all! 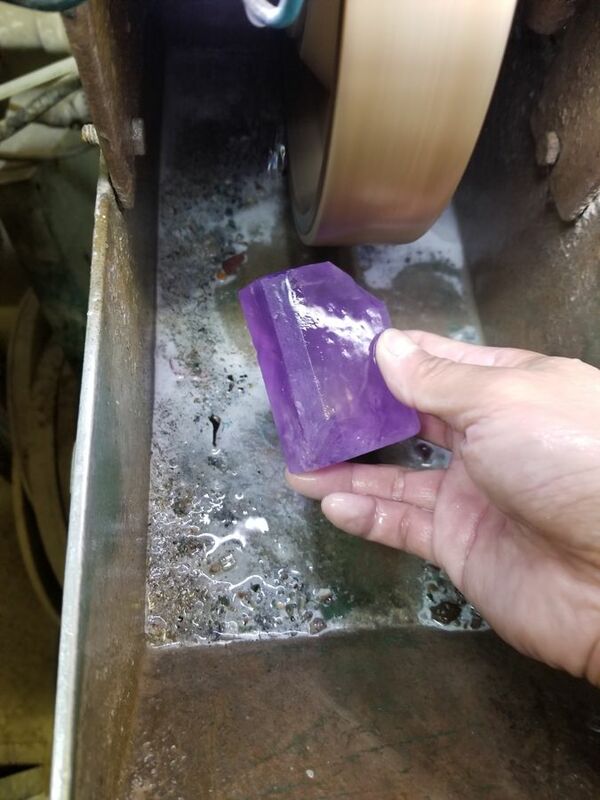 Recently joined a local gem club where the shop has all kind of tool from cutting, grinding to polishing. 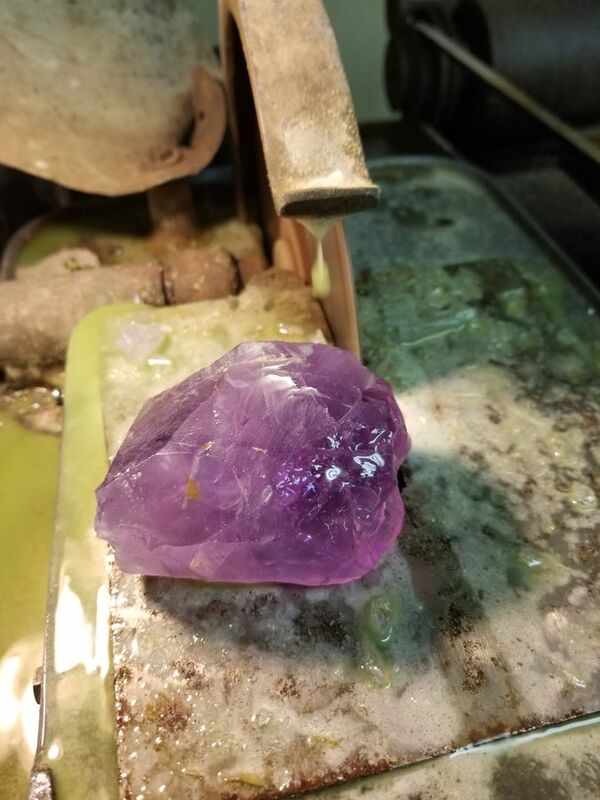 Any tip or tricks on shaping a raw quartz or amethyst related material into a beautiful wand and points? Been searching on nets but am not able to find any tips on it. Hoping someone expert here can direct . I cannot see myself ever doing this to a crystal. Perhaps there are others who will direct you. 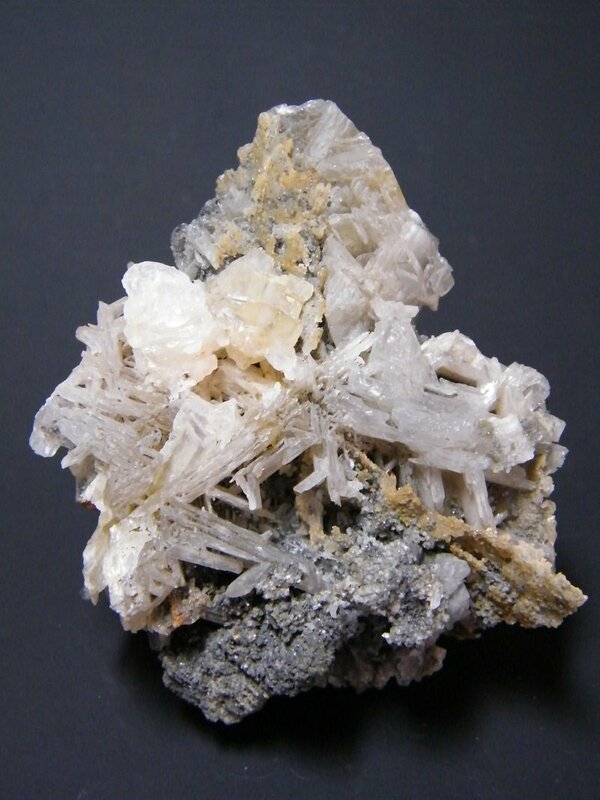 Since you’re in Texas, as am I, you might join the Arlington gem and mineral club if near DFW. They teach cabochon and faceting classes. If it is to really look like a quartz crystal, you have to get all the angles between the facets right. The prism has to have six faces at 60° rotation to each other; you might as well make them the same width. The critical part is the termination. The faces should make an angle of 38° with the long axis of the crysatl, or with the adjacent faces of the prism. Three should be the same size and meet at a point. The other three should be smaller - or you can make all six the same size, but that's not typical for quartz, even an idealized crystal. 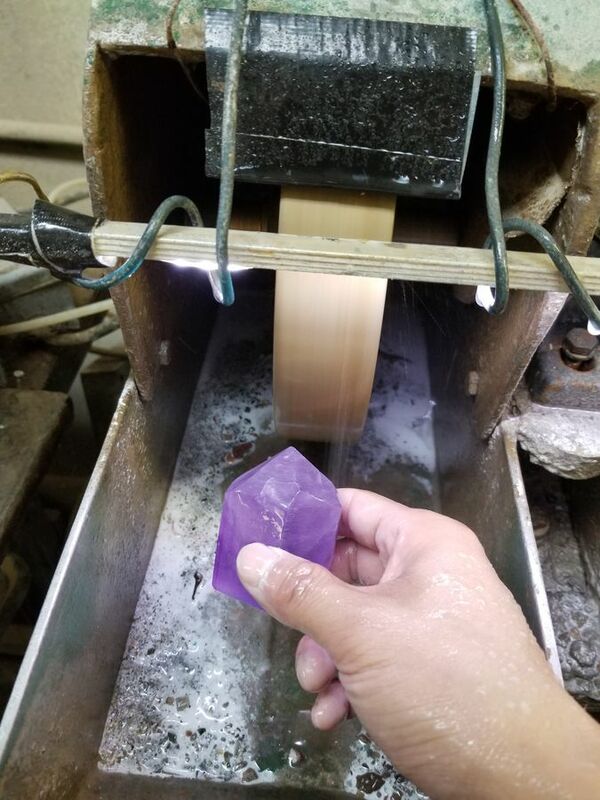 Even with this attention to detail, it won't look like a real amethyst crystal, but it will be geometrically accurate. 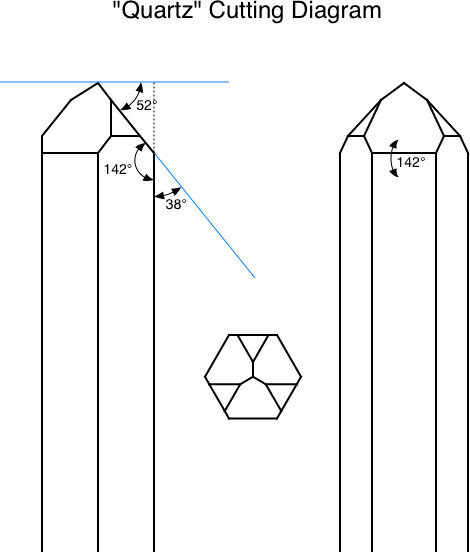 As it happens, I have been working all this out because I am about to try to get someone to make me a "quartz" crystal out of a hexagonal acrylic rod. Consequently, I can attach the diagram below. Plans for a scaled-up needle quartz with a ~40:1 aspect ratio. Come to the Rochester Mineral Symposium to find out why! Nice! 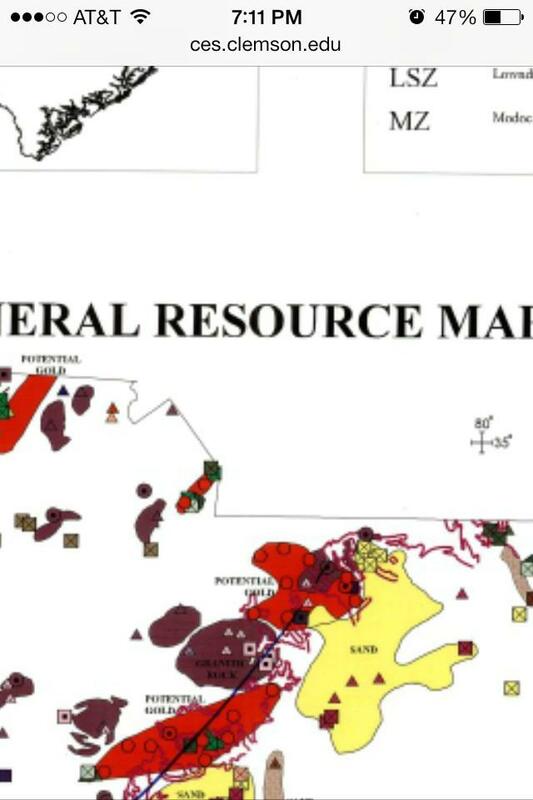 That's a very detailed diagram ! I suppose I'm gonna need measurement tools in order to get those angles right. I am familiar with "smorf.nl" but was not aware of the crystal models. Smorf is a java-based crystal drawing program that the author uses to provide all the crystal drawings for Mindat. He and I have had a number of conversations about our respective crystal drawing programs, Smorf and SHAPE. It's really neat that the author has hooked Smorf up with a 3-D printer to make these crystal models. In principle, anyone could print their own crystals in 3-D.